Machines are helping the human being in every aspect of life, they make our life easier and more comfortable. Washing machines are also being an integral part of our life. The market is filled with hundreds of machines but Only the good products can serve us well. As for now the best washing machine available under 20000 rupees in India is IFB Diva Aqua VX. Let's know deeper about this appliances. The Tub material of Diva Aqua VX is made up of strong Stainless Steel. There is Memory Backup option to save the settings. It is also equipped with the features like Electronic Control, Temperature Control, Program Status Indication, Rapid Wash, Inbuilt Easy Iron, Auto Restart, Auto Imbalance Sensing & Control and many others. In the Hard Water detergent doesn’t mix properly but New IFB Diva Aqua VX comes up with the Aqua Energie mechanism which filters the hard water before releasing it into the machine and softened the water that ultimately causes better washing results with stain-free clothes. Hard Water is now no More Problematic. If you ever forgot to put in some clothes after some washing cycle, Add Laundry feature helps you to add the laundry so you can add Forgotten Laundry without disrupting the current cycle.The grooves of Crescent Moon Drum in the washing machine form a cushion-like protective layer which is even protecting the delicate cloth fibers. IFB is very reputed name when it comes to the washing machine. It also comes up with long lasting 4 Years Comprehensive IFB Warranty. 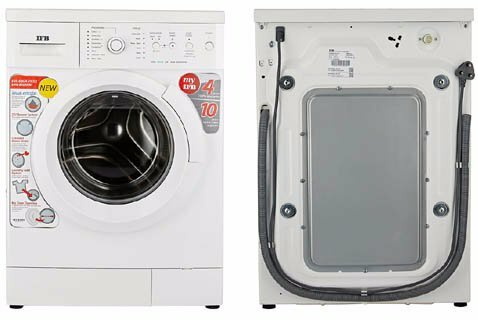 for the full list, you can check the list of IFB Washing Machine.